The products (Carand`Ache Goliath Ball Pen Refill 2medium+1fine) were dispatched the same day and arrived 3 days later to Finland, as promised. Excellent service and great products. Service couldn't be faulted. 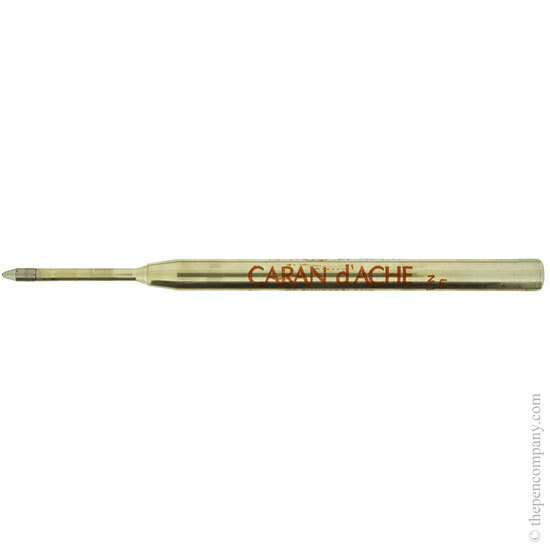 My previous Caran D'ache Goliath Ball Pen Refill lasted for two years even with writing a page-a-day diary. Had this pen for forty years and just found a company to supply refills. Great. My purchase was a simple one. Replacement cartridges for my Caran d'Ache pen. Delivery was as quick as promised. I will be happy to use the Pen Company again. user friendly website, so easy to find refill I required. Good price and speedy delivery. purchased pen refills which I couldn't find anywhere else. I was astounded at the speed in which they arrived. I ordered in the afternoon and they were on my doorstep next morning thank you Pen company. Very helpful phone advice and delivery followed promptly as promised. The only place I could find stocking this item (fine point) and delivered quickly and promptly as promised. Restored my Caran d'Ache ballpen to working order after I had run out of ink about a year ago. Found The Pen Company online and it was very easy to order on their website. Product was competitive compared to other suppliers. Purchased some pen refills which came really quickly.